If you use X10 compatible switches, modules and controllers to automate lighting and appliances throughout your home, adding this simple device will not only allow you to turn your lights on and off and dim them remotely, but you can also schedule timed events easily. The timer plugs into any AC outlet in your home and transmits digitally encoded signals over your home's existing wiring instantly or at the times you set. You'll be able to schedule up to eight lights or appliances to turn on and off automatically. Have outside lights as well as inside lights and appliances go on and off at preset times so you won't walk into a dark home at night. Or give your home a lived-in look while you are away using a security mode that turns lights on and off at random times within a certain time frame. 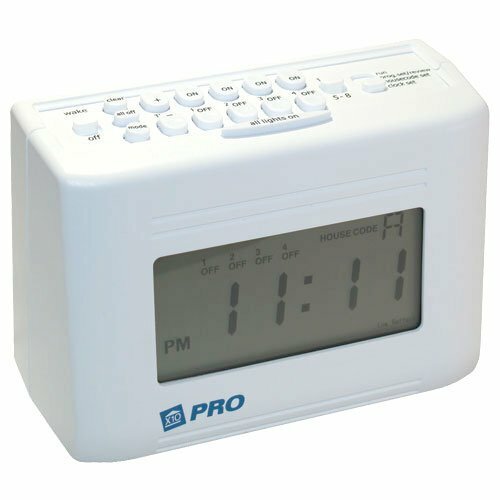 You can even wake up in the morning to light and sound using the built-in alarm clock and buzzer. X10 switches or plug-in modules are required if you wish to control lights and appliances, and are sold separately. This product requires two AA batteries, sold separately.